You may have noticed that Europa has been bouncing around a bit more than it did on HUMPACS East. Well don’t worry…it’s intentional! The general path that Europa is following goes along 20oN latitude. The reason that it is not going in a straight line is because there are numerous seamounts and guyots (aka tablemounts) that we are having it navigate over on it’s way to the Mariana Trench. Seamounts are basically underwater mountains that are at least 1,000m tall. They do not actually reach the ocean’s surface. Guyots are seamounts that did, at one time, rise above the ocean’s surface, but then eroded away, flattened out, and eventually sunk back down underwater. Well, since Europa is basically a very small fish in a very big pond, we need to strategically look for these humpback whales. Even though most of the time the tops of these seamounts and guyots can be found many hundreds, if not thousands, of meters below the ocean’s surface, they are actually great producers of marine ecosystems. That makes us think that we might have a better shot at stumbling upon some humpbacks in those areas, as opposed to simply out in the middle of an even deeper ocean. There has been some research to support the statement that humpbacks seem to frequent seamounts and guyots, though the exact reason why hasn’t been determined. The leading theories are that the landmarks serve as resting and/or feeding areas, points for navigation, and even meeting grounds (source: PubMed Central®). Maybe they’re sharing different versions of their song? At the end of the day, we don’t really know why…yet! If you’d like to dive a little deeper into the science and evolution of a seamount, check out our blog post Mountains in the Deep Sea. Figure 1: Europa’s path on a nautical chart. Europa is currently traveling from East to West, and navigating over many different seamounts and guyots. (Depths are in meters). Figure 2: Zoomed in image to show more detailed depths of the Horizon Tablemount that Europa traveled over Jan 16-19, 2019. Figure 3: Europa circling a particular seamount. We will have Europa do this from time to time to search a little more for humpbacks in areas we suspect them to be. If you check out the HUMPACS page, you’ll notice that from January 16-19 Europa was cruising over the Horizon Tablemount. In another two or three weeks, Europa should be traveling around the HIG Guyot. This particular guyot is of note to us here in Hawaii because it was actually discovered about 37 years ago by the “Kana Keoki” research vessel, and named after the Hawaiian Institute of Geophysics (source: Marineregions.org). So, for those of you that were wondering, and dare we say concerned, about Europa’s up and down path…worry no more! Europa is doing exactly what we want it to do, and we’re collecting lots of great data that we look forward to sharing later on. Until then, keep checking in and watching Europa as it makes it’s way West across the Pacific Ocean. Also, check out our live audio stream of the humpback whales that are swimming around Puako, HI right now! When we were preparing for the first leg of HUMPACS, referred to as HUMPACS East, we found ourselves faced with a tough decision when it came to how the hydrophone should be mounted. When doing hydrophone operations just outside of Puako, Hawaii, we have found that you get the best audio if you hang the hydrophone at least 30 feet below the sub. This, obviously, is due to the fact that we’re basically decoupling the hydrophone from the sub. We also are able to pick up more sounds when we’re deeper. Hearing that, you might wonder why we decided to hard mount the hydrophone during HUMPACS East. 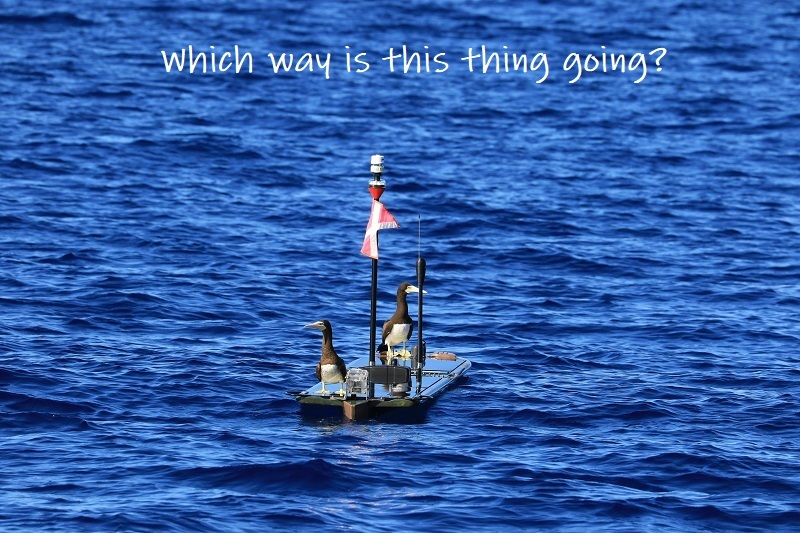 Well, what we have also learned through years of experience monitoring the gliders off the coast of the Big Island is that when we have a hydrophone hanging, ocean currents become a much larger problem. 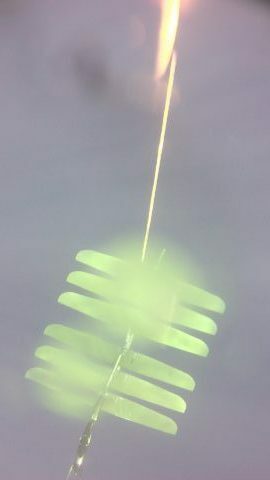 There are different currents at different depths, and so even though the glider (float, sub and hydrophone) are all relatively in vertical alignment, each part of them is getting pushed and pulled by a different current. In Hawaii, it’s not that big of a deal for us because we keep the gliders in a relatively small area the majority of the time, and we can go rescue the glider if we really need to. When sending it across the Pacific Ocean, it’s a different story. There are no rescue missions. It just has to work! For that reason, we decided to keep the hydrophone hard mounted directly to the sub, with no separation or “acoustic isolation”. We knew that the background noise (flow noise, wing springs and rudder) would be very loud. However, we confirmed that even with all this loud background noise we would be able to detect humpback whales, as we did a proof of concept with humpbacks singing off Puako before sending it east. All this was worth it to know that the hydrophone would be very safe. After all, we’d never made this trek before, (no one had for that matter), so we didn’t know what kind of abuse it might encounter. Sharks, rubbish, wear and tear, getting tangled up by the umbilical. These were all big concerns, and, at the time, we needed to play it as safe as possible. All these concerns continued to stand true with HUMPACS West. We still agreed that the unknowns about drifting were too much of a risk, so we mounted it close, but not hard mounted. Since we did not encounter any drift that could have entangled the hydrophone, nor any shark bites, for HUMPACS West, we decided to see what the minimum distance was that we could drop the hydrophone and achieve higher quality audio. We still needed to keep the hydrophone safe, but we wanted more vibration isolation between the sub and the hydrophone itself. After testing many different materials and changing up the distance of which we dropped the hydrophone below the sub we came to the conclusion that a three inch drop using EPDM Fiberglass Reinforced rubber sheets to mount was the way to go. It improved our audio and also kept the hydrophone safe at the same time. 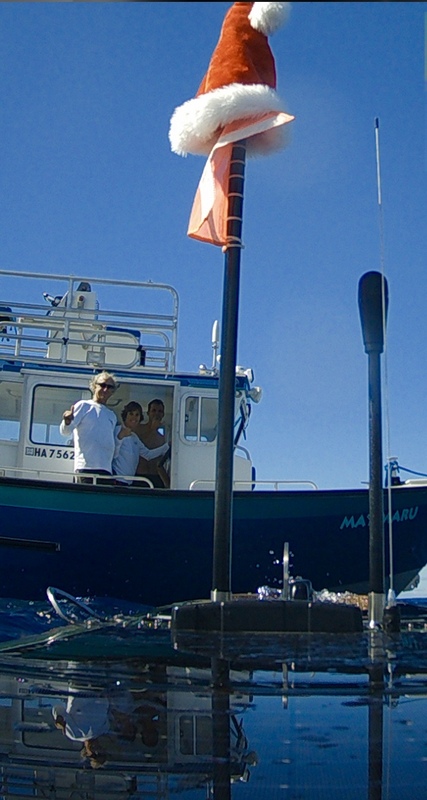 As an additional safety measure, we added a deflector bar to the bottom of the sub to help prevent shark bites and entanglement on the hydrophone. Take a look at the two spectrograms below and see the difference in noise levels. HUMPACS West is exponentially more quiet than HUMPACS East. There is also almost a complete elimination of the 650Hz and 975Hz harmonics from the rudder module. This, alone, is a very improved piece of the puzzle, as the primary range that we listen and view the humpbacks’ song is in that <1KHz range. As you can see, HUMPACS West is much more quiet as far as background noise goes. What’s that do for us? Well, if the background noise is less, then it becomes substantially easier to detect humpback whales (and other species). This improvement should greatly improve our post processing efforts, and is more efficient at detecting as many humpbacks as possible. 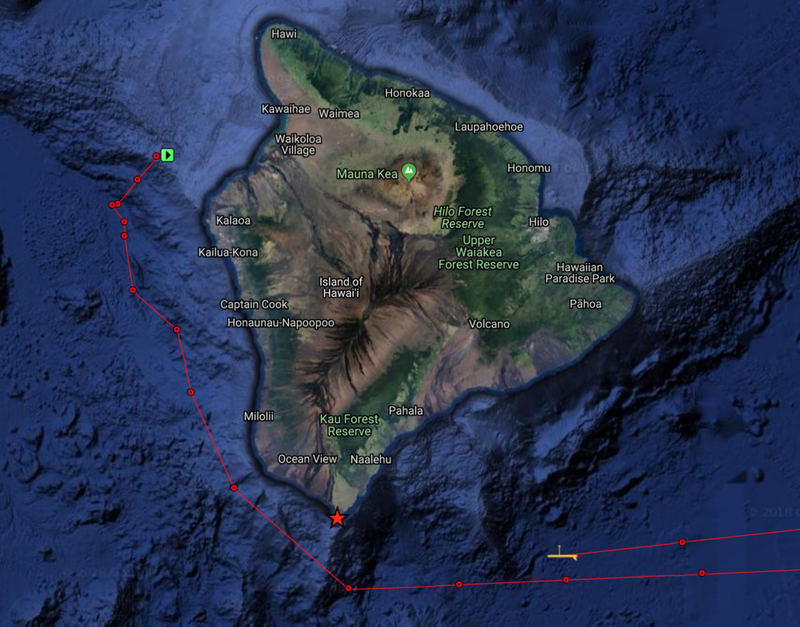 Currently, Europa is a little over 700nm (nautical miles) west of the Big Island of Hawaii. Follow its journey on the HUMPACS page! Europa is back in the water on her second mission to listen for humpback whales, just in time for the Holidays. Last year, Europa successfully completed the East Leg (from Hawaii to the Baja California Seamount Province and back), and now she will swim to the Mariana Trench and back (the West Leg). Biologists have wondered if there is an undiscovered distribution of humpback whales among the seamounts between these areas. Since the East Leg was successful, we hope Europa’s journey west will be triumphant. You can track Europa’s path on our website. Stay tuned for more updates! Wishing you a Happy Holiday and a Joyful New Year! Almost one month has passed since we recovered Europa, and we are still in the process of analyzing data, however; we have reviewed all of our photos. During the 3.5 month mission, we had a camera attached to both the top and bottom of Europa’s float that took above and underwater images periodically on a daily basis. The top camera was mounted on the back of the float looking forward, which enabled us to inspect the float and antenna deck during the mission. The bottom camera looked down towards the sub underneath the water to help us check the sub and umbilical. In the previous blog, we mentioned we had a gooseneck barnacle that grew over the underwater camera lens. Even so, we were still able to get glimpses of the sub for diagnostic purposes. Over the 3.5 month mission, the top and bottom mounted cameras took over 500 photos each. We have constructed two time-lapse videos of the above and underwater pictures, which are each a little over three minutes long. We were able to capture some fantastic photos! The sunset photos and waves washing over the float are captivating, and it’s fun to watch the barnacle grow over time in the underwater footage. In our next blog, we will post some sample of audio files of some exciting sounds we’ve heard, including odontocetes whistles and clicks, echolocation, and other unusual noises. Stay tuned! Oh Barnacles, those Crusty Foulers! Barnacles are pesky little creatures. Have you ever heard of Barnacle Bill, the foulest sailor? Well, he’s named that for a reason. Sailors, shipowners, and mariners hate barnacles because they attach to the bottoms of boats and ships (biofouling). Large barnacle colonies weigh marine vessels down, which causes them to drag and burn more fuel. In our case, they stick to the bottom of our Wave Gliders and block the camera’s field of view. Biofouling is a process where invertebrates, including barnacles, mussels, sponges, and corals stick to marine surfaces. For this to occur, a biofilm consisting of bacteria, algae, seaweed, or diatoms must first form on the substrate. The formation of biofilm is dependent on many environmental factors, however, once it develops, the biofoul rapidly increases. To prevent biofouling, we experimented with an antifouling Coppercoat™ paint and a 90-10 copper-nickel alloy before deploying Europa. First, we painted the entire vehicle with the Coppercoat™. If we didn’t do this step, a thick layer of barnacles and algae would encrust Europa and significantly weigh her down. We then sheathed the camera within a copper-nickel casing with an acrylic lens in hopes that biofouling would not occur. This image displays the bottom of Europa's float, painted with a Coopercoat paint. The Camera (facing down) is encased in a copper-nickel alloy housing with an additional copper ring around the acrylic lens to prevent biofouling. As a secondary safeguard, we incorporated an additional biofoul resistant copper ring around the lens. Unfortunately, that didn’t work as we’d hoped. Europa has had a barnacle progressively developing over the camera’s field of view for over a month, and there’s nothing we can do about it. Their lifespan is 8-20 years so that barnacle will keep growing until Europa’s mission is complete, at which time we will identify this barnacle. 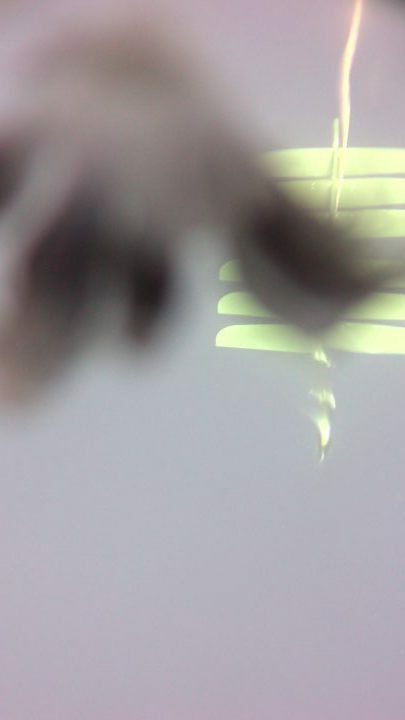 Below is an image sequence of the barnacle forming in the camera lens. So, besides being annoying, what is a barnacle’s purpose and ecological role? Barnacles are in the Crustacea taxon, meaning they are related to shrimps, lobsters, and crabs. They are most abundant in areas where upwelling occurs, worldwide. As larvae, barnacles function as zooplankton; microscopic organisms that float around as food for other critters. As they morph into adulthood, they affix themselves to surfaces, such as rocks, ships or whales, and eat microscopic plankton through feather-like appendages called cirri. Primarily, they play a trophic role in balancing plankton populations. Barnacles secrete a robust adhesive substance like super glue that has enormous medical and engineering potential. Scientists have discovered barnacle’s glue binds the same way humans’ blood does when it clots. By researching it further, scholars can gain more information about how to prevent barnacles from fouling. Visibility in the ocean is relatively weak, especially at a depth of 400+ meters, making vision rather useless in the deep sea where whales reside. Sunlight doesn’t travel very far into the ocean. However, acoustic vibrations travel faster and farther in water than they do on land (Image 1). Therefore, sounds are valuable tools in deep, dark environments where whales use their ears as their eyes. Image 1: An image by NOAA. A visual representation how far low-frequency sounds travel through the ocean. Animals in marine environments rely on sound for basic survival needs. For example, baleen whales, which are the largest of marine mammals (including humpback, blue, fin, right, and gray whales, etc.) emit long, low-frequency sounds ranging from 7Hz to 22kHz that travel long distances across the ocean. Baleen whales also travel long distances making periodic migratory trips from their feeding grounds to their breeding grounds. Thus, scientists hypothesize that baleen whales use low-frequency sound in part to aid in navigation and long-distance communication. The ocean is already a naturally loud environment, and humans have significantly increased that noise level. 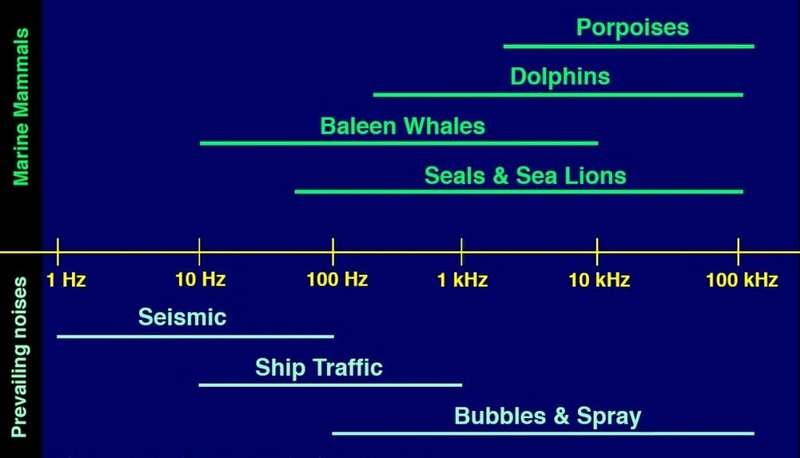 Anthropogenic noise pollution (such as ship traffic) obscures animals' communication, and could potentially have adverse effects on marine life; especially baleen whales (Image2). Although, considerable scientific uncertainty remains. Many factors influence the degree of impact, including multiple characteristics of the sound, and the animal. Potential impacts include behavior alternation, temporary hearing loss, and various communication interferences (Image 3). Image 2: An image by the University of Rhode Island. A visual representation (in frequency (Hz)) of how anthropogenic noises interfere with marine mammals. Baleen whales' sounds are masked by seismic, ship traffic and bubbles & spray noises. Image 3: An image by SSPA. A visual representation of anthropogenic noise interference with marine animals. Scientists study sounds and their relationship with the environment over a wide range of scales (both spatial and temporal) via a new science called ecoacoustics. They investigate sounds to understand their evolution, functions, and properties under environmental stressors and changes. Sounds are used as tools to monitor ecological factors, such as biotic and abiotic relationships, and animal behavior, diversity, abundance, distribution, etc. Using hydrophones to record marine acoustics have helped scientists gain knowledge, and a better understanding of the ocean and how we’re affecting it. We are proud to say our Wave Gliders (WGs) don’t produce noise that’s harmful to whales or other marine life. So far, we think WGs do not deter animals: fish aggregate around them, birds rest on them, whales swim near them, and dolphins bow ride them. The WG has revolutionized the way we collect data and monitor the ocean. The hydrophone we attached to Europa is gathering acoustic data 24/7 through which we hope to gain more knowledge and understanding of the sea. Additionally, we expect our data will create a baseline, and contribute to marine ecoacoustics, as well as, support conservation efforts and the management of marine resources. Europa is approaching our second seamount; we’re within 25 miles! Stay tuned for a seamount update, the ecology of seamounts, and the habitats they provide in our next blog.